Watching country foxes at their breeding den does not have the same popular appeal as, say, badger watching, for after all, foxes don't have a cuddly, people-friendly image, breeding dens are usually relatively difficult to find, and the dens are not necessarily occupied outside the breeding season nor in successive years. But the effort involved is certainly worthwhile as there are few sights in nature more appealing than that of fox cubs doing what fox cubs do - playing, fighting between themselves, searching for morsels amongst grass or leaf litter, pouncing on bracken stems as if the stems were hunted animals, grooming themselves and each other, exploring their surroundings or simply sitting and waiting for an adult to return with food. There is a caveat, however, for watching country foxes at their breeding den carries a significant risk of disturbing the family, even though the cubs themselves can be quite confiding - in the absence of an adult, they will usually scurry underground when alarmed, but quickly reappear to investigate the source of disturbance, and if satisfied that all is well, will continue with whatever it was they were doing. Adults, though, are altogether different. Understandably wary of human and other interference, if disturbed they will readily move the family, particularly very young cubs, picked up one at a time by the scruff of the neck, to a new den, an undertaking that itself risks loss of a cub here or there along the way, or maybe the whole group should the new den not be completely suitable. Furthermore, not a lot escapes their attention for they are highly intelligent creatures that possess exceptionally keen senses of smell, sight and hearing and, as they travel far and wide in search of food, they may quickly locate watchers positioned even a distance away. (On one occasion, whilst sitting inconspicuously on a New Forest hillside watching cubs around a den in the valley below, I noticed an adult fox sitting on the opposite hillside, watching me! And another time at a different den, I remember noticing an adult on the edge of an inclosure 100 metres, or so, away, again watching me, watching its cubs. Needless to say, in both cases, I quickly left and allowed feeding to commence). First of all, however, it's necessary to find an occupied den that offers the potential for reasonable views, although when fox cubs are very young and still living wholly underground, there’s often little above-ground evidence that a den is occupied. (The presence of adult fox droppings might offer clues as they are sometimes left nearby from mid-winter onwards, perhaps as territorial markers and / or to communicate the extent of female fertility). Good fortune may also play a part in the search. On one occasion, my little dog was busily examining what was thought to be a heathland rabbit burrow only for a tiny fox cub to appear in the entrance, almost nose to nose with a very surprised pooch. Both rapidly retreated, the cub back down the tunnel, the dog in the opposite direction, neither any the worse for their encounter. Then, again at an old rabbit warren, this one near Pig Bush, I accidentally encountered cubs out playing during the day, animals that subsequently over a number of weeks provided good views using binoculars from the comfort of my car. And on a number of occasions whilst watching badgers, I've belatedly realised that, unbeknown to me, a fox family was also in residence in the sett, and have subsequently enjoyed views of both badger and fox families. Locating breeding dens, however, is not always that straight-forward, although signs of occupation do increase as the breeding season progresses and the cubs begin to regularly venture above ground. Trampled bracken, scattered fox cub droppings, discarded rabbits’ legs, squirrels’ tails, bird remains and even quite large skulls are all familiar signs that a fox family is in residence nearby. 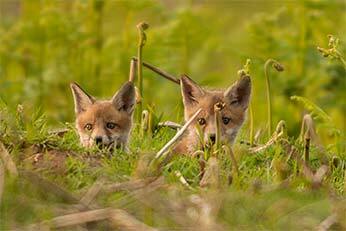 Fox watching without creating disturbance can also become considerably easier later in the breeding cycle, despite rapidly encroaching bracken potentially obscuring the view, for then adults spend increasingly longer periods away hunting on behalf of their ever-demanding litter. 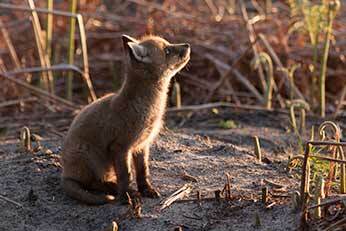 How far New Forest foxes travel in the quest for food is open to speculation, but fox cubs are often left alone for hours at a time, suggesting that the hunt can sometimes be long. But for the watcher (and the cubs) the wait is worthwhile, for feeding time really is a sight to behold for those fortunate enough to obtain a glimpse into this aspect of fox family life.